In many countries, the standard way of treating autistic children is with behavioural therapy - stimulating and rewarding them to develop the skills they need to function in society - but France still puts its faith in psychoanalysis. And an increasing number of parents are now demanding change. For autism campaigners, it is one of the most serious health scandals of our times. How for decades France turned its back on the latest scientific thinking, and treated autism as a form of psychosis. How, as a result, tens of thousands of children were misdiagnosed - or not diagnosed at all - and consigned to lives of misery. And how, to this day, in its approach to autism, the French medical establishment continues to believe in the powers of psychiatry and psychoanalysis - long after the rest of the world has switched to alternative methods of treatment. "It is an out-and-out disgrace," according to Daniel Fasquelle, a member of parliament who campaigns on the issue. "Every day I am contacted by parents with the same story - how their child's autism was not detected in time, so they never had the treatment that they needed. "Thousands of children could have been saved. They do it everywhere else. Why not here? It is France's shame." The row over autism in France has festered unreported for years. But recently it has become public. Independent associations have been created, lobbying for a move away from psychoanalysis and psychiatry, and over to the "behaviourist" treatments that prevail elsewhere. In early March, these groups scored an important victory - with a ruling from the health ministry that calls into question the use of psychoanalysis as a treatment for autism. But the psychoanalysts are not taking it lying down. From their point of view, behaviourism is a form of superficial social conditioning that does not address root causes - and they resent the way they have been typecast as the villains of the piece, when their aims are as sincere as those of their opponents. "One thing that never pays in the field of autism is triumphalism," said Lauriane Brunessaux, a child psychiatrist. 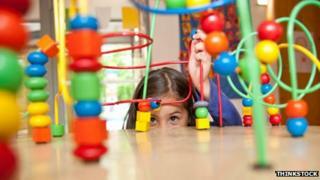 "Autism is far too complex, and we understand it so badly. "Today it is the behaviourists who are being triumphalist." The behaviourist approach to autism was developed in the 1970s and 80s in the US and Canada, and it is now the norm in most of the world. Under the so-called ABA method (Applied Behavioural Analysis), autism is treated as primarily an educational - rather than a medical - problem. With a set of rewards (which can be granted or withheld) - and with plenty of individual attention - children can learn to function in society, and be much less of a burden on their families. "If you diagnose early, and then give the right treatment between the ages of two and seven, 70% of autistic children can acquire functional language skills. Here in France, we are way off that figure," says Fasquelle. "And the same pattern continues later in life. In the UK, there are 17 times more university students with autism than in France. It is unacceptable." The blame - Fasquelle and autism associations argue - lies with a medical establishment that remains fixated with Freud. "Today everyone knows that autism is a neuro-developmental problem. It is not a psychosis or mental disorder," says Muhamed Sajidi, president of the association Conquer Autism. "But in France it is the psychiatrists - heavily influenced by Freudian psychoanalysis - who remain in charge. And they have shut themselves off from all the changes in our knowledge of autism." Sajidi set up the association after his life was "destroyed", as he puts it, by the medical establishment's failure to diagnose his son Sami's autism. For him, as for many others, one of the worst aspects is how blame for autism has been laid at the door of the child's parents, and more especially of the mother. "The first time I went to see a doctor when my (autistic) son Gael was three and we thought there was a problem, the psychiatrist asked me if I had wanted him - if it had been a wanted pregnancy!" says Candy Lepenuizic, a British woman married to a Frenchman. While France struggles with how to treat autistic children, the US is puzzled by how many people are affected, and why. A study by the Center for Disease Control and Prevention (CDC) reports that the incidence of Asperger's, Autism or Pervasive Developmental Disorder is much higher than previously thought - one in 88 children are thought to be on the autism spectrum, not one in 110 as previously reported. "These CDC numbers should serve as a wake up call to us all," says Lawrence Korchnak, vice-president of the Autism Society in Maryland. Much of the change has been attributed to better reporting in African-American and Hispanic communities. But whether or not that's the sole reason is impossible to say, says Craig J Newschaffer, director of the A J Drexel Autism Institute in Philadelphia. "We're left wondering whether some of this could be due to a real increase in risk," he says. "Then she asked what sort of dreams I had had while I was pregnant with him. And suggested the whole family have a course of psychotherapy. "At that point I got up and walked out. It was only because I had been warned this might happen that I did not burst into tears." Such horror stories are typical in French families of autistic children. "The whole idea was that it wasla faute à maman(the mother's fault). It was the 'refrigerator mum', or there was some problem with the family dynamic," says Lepenuizic. "They thought that if the child was failing to communicate with the outside world, it was because of some trauma in the womb or in very early life. There was a family malfunction, and we had to cure it!" Critics say this emphasis on psychoanalysis and relationships meant that autistic children were not spotted till far too late. And that, in turn, meant that their chances of effective treatment were sharply reduced. Some 60% of autistic children in Sweden attend school, Sajidi says. "Today only 20% of autistic children in France are in school, and often only part-time. The rest are either in psychiatric hospitals, or in medico-social centres, or living at home - or in Belgium," says Sajidi. "Many families are sending their children to Belgium, where it is much easier to set up behaviourist treatment centres. "Things are changing now, because parents are refusing to be taken for a ride by the professionals. But the real tragedy is with France's autistic adults, many of whom are in a state of total incomprehension or even self-mutilation. "Seventy-five percent of families with autistic children end in divorce, and normally it is with the mother that the autistic person stays. Changing behaviour is one thing. But what do you do with the trouble that lies behind it? "Today these poor elderly women are looking after their adult children with no knowing what will happen when they die." If Sajidi and other campaigners are beginning to feel the wind turn, it is because the health ministry is finally beginning to fund pilot schemes for behaviourist schools, as well as early diagnosis centres. In its recent report, the ministry also effectively outlawed a practice known as "packing" where autistic children are wrapped in damp cloths in order to reconnect with their bodies. Campaigners say the treatment is both barbaric and ineffective. The fundamental problem, campaigners argue, is that the psychiatric profession is resisting calls for change, because the fewer patients there are, the less they earn. "They have a financial interest in institutionalising autistic children," says Sajidi. Lepenezuic says: "The state pays. The child doesn't get any better - but who cares? It's being looked after by the state, and the doctors are making a lot of money. Why would they change the system?" But on the other side of the fence, such charges are deeply resented. Child psychiatrists like Lauriane Brunessaux believe that the associations have grossly distorted the debate, and are engaged in a battle to "discredit psychoanalysis and the whole notion of the unconscious". Defenders of the French system argue that the situation was never as one-dimensional as the behaviourists have claimed. In a 1949 paper, psychiatrist Leo Kanner suggested "parental coldness, obsessiveness, and a mechanical type of attention to material needs only" left children in "refrigerators" and caused them to withdraw and "seek comfort in solitude"
First of all, they say, there have been plenty of success stories emanating from a psychoanalytical treatment of autism. They just have not been so loudly trumpeted. Secondly, it is not as if the behaviourist approach is itself beyond criticism. In the US and Canada, argues Brunessaux, there have been studies that raise serious questions over its true scientific validity. "The only real scientific reference for behaviourism is the electric shock experimentation on rats carried out by (US psychologist) Burrhus Skinner in the 1940s. "Obviously the methods of reward and punishment today are totally different. But that is the background to behaviourism," she says. For leading French psychoanalyst Eric Laurent, there is a deeper problem. "Changing behaviour is one thing. But what do you do with the trouble that lies behind it? It is all very well to focus on the skills that can be transmitted via an intensive behaviourist approach, but that leaves a whole dimension out of the picture," he says. As for the charge that psychoanalysts are responsible for family breakdown, Laurent is equally dismissive. "The idea that you had to wait for psychoanalysts to come along for there to be hatred inside families is ridiculous. Hatred has always been there. "Psychoanalysis is being used as a scapegoat - though we should not perhaps mind that, as being a scapegoat is part of the role of psychoanalysis," he says. What angers people like Brunessaux and Laurent is that while on their side of the debate they are quite prepared to admit the effectiveness of behaviourism - as one of several possible approaches to autism - the behaviourists are dogmatically tied to their system and theirs alone. Whoever is ultimately in the right, what the autism row perhaps shows most clearly is the changing nature of French society. Once, families did what they were told. The state was ultimately benevolent, and had massive resources to dispense. If doctors chose institutionalisation, then who was to argue? Today it is different. Thanks to the spread of knowledge, the internet, consumerism and the decline of the collective spirit - families for the first time feel emboldened to think, and act, for themselves.